New York: Dover, 1995 235 pp. Small folio, full score. Very light wear to extremities, text clean and white. 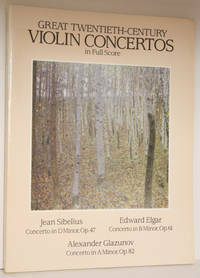 Jean Sibelius; Concerto in A minor for violin with orchestral accompaniment (in one movement), op. 82 (1905), originally published: Berlin : Schlesinger (Robert Lienau), [1905?]. Alexander Glazunov; Concerto in B minor for violin and orchestra, op. 61 (1909-10), originally published: Leipzig : M.P. Belaieff, 1905. Elgar, Concerto in D minor for violin and orchestra, op. 47 (1903, revised 1905), originally published: London : Novello, 1910. . Wraps. Near Fine. 9'' X 12''.